Die Martis, 1 Octobris, 1650. RESOLVED, That the Sheriffs of Middlesex and London do take care for the Execution of the Judgment of Parliament against Lawrence Clarkson; and that he be sent to the House of Correction, according to the said Judgment; and, at the Time thereby appointed, that he be sent into Banishment. Resolved, That Twenty Marks be paid out of the Box to the Persons who discovered and apprehended Lawrence Clarkson, and to Henry Newman, a Servant to the Serjeant at Arms, who hath kept him in Custody, in such Sort, as the Committee to whom that Business was referred, direct: And that the Serjeant at Arms attending the Parliament do pay the same accordingly. Ordered, That the Commissioners for Compounding be authorized and required to issue their Warrant to the Treasurers for the Receipt of Haberdashers Hall, to pay One hundred and Thirty Pounds to Paul Freeman, Robert Worrall, Richard Minling, Margaret Fletcher, and Alice Freeman, of Leeds in the County of Yorke, in full Satisfaction of the Sum of Three hundred Pounds, by Order of Parliament of the One-and-twentieth of July 1647, appointed to be provided and raised out of the Estates of such concealed Delinquents in the County of York, as were not then sequestred, for and towards the Satisfaction of their Losses: And that the Acquittance and Acquittances of the said Paull Freeman, Robert Worrall, Richard Nimling, Margaret Fletcher, and Alice Freeman, or their Assigns, shall be a sufficient Discharge to the said Treasurers, for the said One hundred and Thirty Pounds, or any Part thereof. Ordered, That, in the Order of the One-and-thirtieth of July 1650, touching Sir Roger Cooper, the Word "Principal" be inserted. Resolved, That the House do take into Consideration Publick Business only, until the First Day of November: And that all private Business be excluded until that Time. Resolved, That Thursday-sevennight be appointed for Alderman Thomas Andrewes, Elect Lord Mayor of London, to be presented to the Parliament, for his Election to be taken into Consideration for their Approbation. 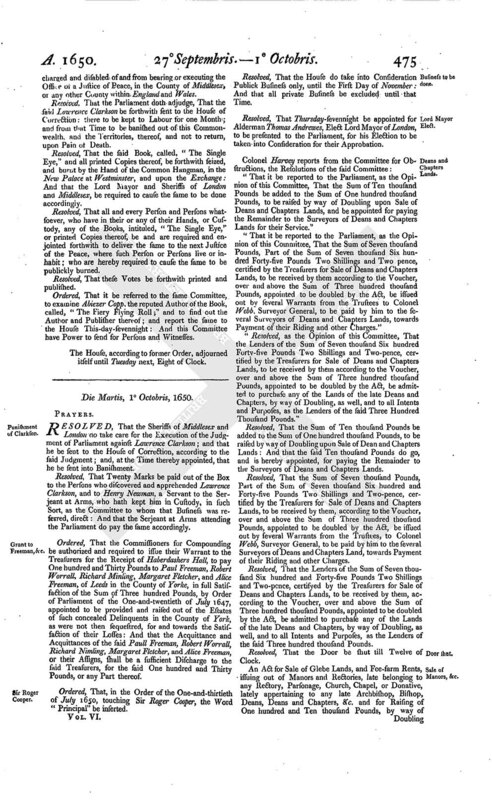 "That it be reported to the Parliament, as the Opinion of this Committee, That the Sum of Ten thousand Pounds be added to the Sum of One hundred thousand Pounds, to be raised by way of Doubling upon Sale of Deans and Chapters Lands, and be appointed for paying the Remainder to the Surveyors of Deans and Chapters Lands for their Service." "That it be reported to the Parliament, as the Opinion of this Committee, That the Sum of Seven thousand Pounds, Part of the Sum of Seven thousand Six hundred Forty-five Pounds Two Shillings and Two pence, certified by the Treasurers for Sale of Deans and Chapters Lands, to be received by them according to the Voucher, over and above the Sum of Three hundred thousand Pounds, appointed to be doubled by the Act, be issued out by several Warrants from the Trustees to Colonel Webb, Surveyor General, to be paid by him to the several Surveyors of Deans and Chapters Lands, towards Payment of their Riding and other Charges." "Resolved, as the Opinion of this Committee, That the Lenders of the Sum of Seven thousand Six hundred Forty-five Pounds Two Shillings and Two-pence, certified by the Treasurers for Sale of Deans and Chapters Lands, to be received by them according to the Voucher, over and above the Sum of Three hundred thousand Pounds, appointed to be doubled by the Act, be admitted to purchase any of the Lands of the late Deans and Chapters, by way of Doubling, as well, and to all Intents and Purposes, as the Lenders of the said Three Hundred Thousand Pounds." 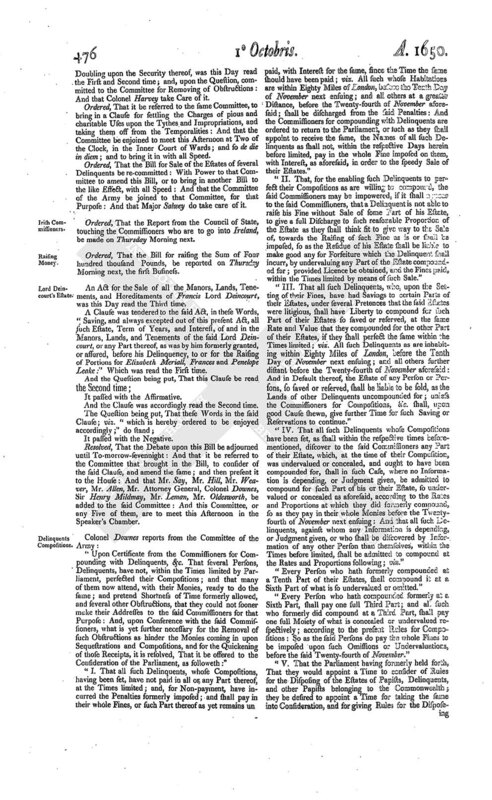 Resolved, That the Sum of Ten thousand Pounds be added to the Sum of One hundred thousand Pounds, to be raised by way of Doubling upon Sale of Dean and Chapters Lands: And that the said Ten thousand Pounds do go, and is hereby appointed, for paying the Remainder to the Surveyors of Deans and Chapters Lands. Resolved, That the Sum of Seven thousand Pounds, Part of the Sum of Seven thousand Six hundred and Forty-five Pounds Two Shillings and Two-pence, certified by the Treasurers for Sale of Deans and Chapters Lands, to be received by them, according to the Voucher, over and above the Sum of Three hundred thousand Pounds, appointed to be doubled by the Act, be issued out by several Warrants from the Trustees, to Colonel Webb, Surveyor General, to be paid by him to the several Surveyors of Deans and Chapters Land, towards Payment of their Riding and other Charges. Resolved, That the Lenders of the Sum of Seven thousand Six hundred and Forty-five Pounds Two Shillings and Two-pence, certifyed by the Treasurers for Sale of Deans and Chapters Lands, to be received by them, according to the Voucher, over and above the Sum of Three hundred thousand Pounds, appointed to be doubled by the Act, be admitted to purchase any of the Lands of the late Deans and Chapters, by way of Doubling, as well, and to all Intents and Purposes, as the Lenders of the said Three hundred thousand Pounds. Resolved, That the Door be shut till Twelve of Clock. An Act for Sale of Glebe Lands, and Fee-farm Rents, issuing out of Manors and Rectories, late belonging to any Rectory, Parsonage, Church, Chapel, or Donative, lately appertaining to any late Archbishop, Bishop, Deans, Deans and Chapters, &c. and for Raising of One hundred and Ten thousand Pounds, by way of Doubling upon the Security thereof, was this Day read the First and Second time; and, upon the Question, committed to the Committee for Removing of Obstructions: And that Colonel Harvey take Care of it. Ordered, That it be referred to the same Committee, to bring in a Clause for settling the Charges of pious and charitable Uses upon the Tythes and Impropriations, and taking them off from the Temporalities: And that the Committee be enjoined to meet this Afternoon at Two of the Clock, in the Inner Court of Wards; and so de die in diem; and to bring it in with all Speed. Ordered, That the Bill for Sale of the Estates of several Delinquents be re-committed: With Power to that Committee to amend this Bill, or to bring in another Bill to the like Effect, with all Speed: And that the Committee of the Army be joined to that Committee, for that Purpose: And that Major Salwey do take care of it. Ordered, That the Report from the Council of State, touching the Commissioners who are to go into Ireland, be made on Thursday Morning next. Ordered, That the Bill for raising the Sum of Four hundred thousand Pounds, be reported on Thursday Morning next, the first Business. An Act for the Sale of all the Manors, Lands, Tenements, and Hereditaments of Francis Lord Deincourt, was this Day read the Third time. A Clause was tendered to the said Act, in these Words, "Saving, and always excepted out of this present Act, all such Estate, Term of Years, and Interest, of and in the Manors, Lands, and Tenements of the said Lord Deincourt, or any Part thereof, as was by him formerly granted, or assured, before his Delinquency, to or for the Raising of Portions for Elizabeth Meriall, Frances and Penelope Leake:" Which was read the First time. And the Clause was accordingly read the Second time. Resolved, That the Debate upon this Bill be adjourned until To-morrow-sevennight: And that it be referred to the Committee that brought in the Bill, to consider of the said Clause, and amend the same; and then present it to the House: And that Mr. Say, Mr. Hill, Mr. Weaver, Mr. Allen, Mr. Attorney General, Colonel Downes, Sir Henry Mildmay, Mr. Leman, Mr. Oldesworth, be added to the said Committee: And this Committee, or any Five of them, are to meet this Afternoon in the Speaker's Chamber. "Upon Certificate from the Commissioners for Compounding with Delinquents, &c. That several Persons, Delinquents, have not, within the Times limited by Parliament, perfected their Compositions; and that many of them now attend, with their Monies, ready to do the same; and pretend Shortness of Time formerly allowed, and several other Obstructions, that they could not sooner make their Addresses to the said Commissioners for that Purpose: And, upon Conference with the said Commissioners, what is yet further necessary for the Removal of such Obstructions as hinder the Monies coming in upon Sequestrations and Compositions, and for the Quickening of those Receipts, it is resolved, That it be offered to the Consideration of the Parliament, as followeth:"
"I. That all such Delinquents, whose Compositions, having been set, have not paid in all or any Part thereof, at the Times limited; and, for Non-payment, have incurred the Penalties formerly imposed; and shall pay in their whole Fines, or such Part thereof as yet remains un paid, with Interest for the same, since the Time the same should have been paid; viz. All such whose Habitations are within Eighty Miles of London, before the Tenth Day of November next ensuing; and all others at a greater Distance, before the Twenty-fourth of November aforesaid; shall be discharged from the said Penalties: And the Commissioners for compounding with Delinquents are ordered to return to the Parliament, or such as they shall appoint to receive the same, the Names of all such Delinquents as shall not, within the respective Days herein before limited, pay in the whole Fine imposed on them, with Interest, as aforesaid, in order to the speedy Sale of their Estates." "II. That, for the enabling such Delinquents to perfect their Compositions as are willing to compound, the said Commissioners may be impowered, if it shall appear to the said Commissioners, that a Delinquent is not able to raise his Fine without Sale of some Part of his Estate, to give a full Discharge to such reasonable Proportion of the Estate as they shall think fit to give way to the Sale of, towards the Raising of such Fine as is or shall be imposed, so as the Residue of his Estate shall be liable to make good any for Forfeiture which the Delinquent shall incurr, by undervaluing any Part of the Estate compounded for; provided Licence be obtained, and the Fines paid, within the Times limited by means of such Sale." "III. That all such Delinquents, who, upon the Setting of their Fines, have had Savings to certain Parts of their Estates, under several Pretences that the said Estates were litigious, shall have Liberty to compound for such Part of their Estates so saved or reserved, at the same Rate and Value that they compounded for the other Part of their Estates, if they shall perfect the same within the Times limited; viz. All such Delinquents as are inhabiting within Eighty Miles of London, before the Tenth Day of November next ensuing; and all others further distant before the Twenty-fourth of November aforesaid: And in Default thereof, the Estate of any Person or Persons, so saved or reserved, shall be liable to be sold, as the Lands of other Delinquents uncompounded for; unless the Commissioners for Compositions, &c. shall, upon good Cause shewn, give further Time for such Saving or Reservations to continue." "IV. That all such Delinquents whose Compositions have been set, as shall within the respective times beforementioned, discover to the said Commissioners any Part of their Estate, which, at the time of their Composition, was undervalued or concealed, and ought to have been compounded for, shall in such Case, where no Information is depending, or Judgment given, be admitted to compound for such Part of his or their Estate, so undervalued or concealed as aforesaid, according to the Rates and Proportions at which they did formerly compound, so as they pay in their whole Monies before the Twentyfourth of November next ensuing: And that all such Delinquents, against whom any Information is depending, or Judgment given, or who shall be discovered by Information of any other Person than themselves, within the Times before limited, shall be admitted to compound at the Rates and Proportions following; viz." "Every Person who hath formerly compounded at a Tenth Part of their Estates, shall compound it at a Sixth Part of what is so undervalued or omitted." "Every Person who hath compounded formerly at a Sixth Part, shall pay one full Third Part; and all such who formerly did compound at a Third Part, shall pay one full Moiety of what is concealed or undervalued respectively; according to the present Rules for Compositions: So as the said Persons do pay the whole Fines to be imposed upon such Omissions or Undervaluations, before the said Twenty-fourth of November." 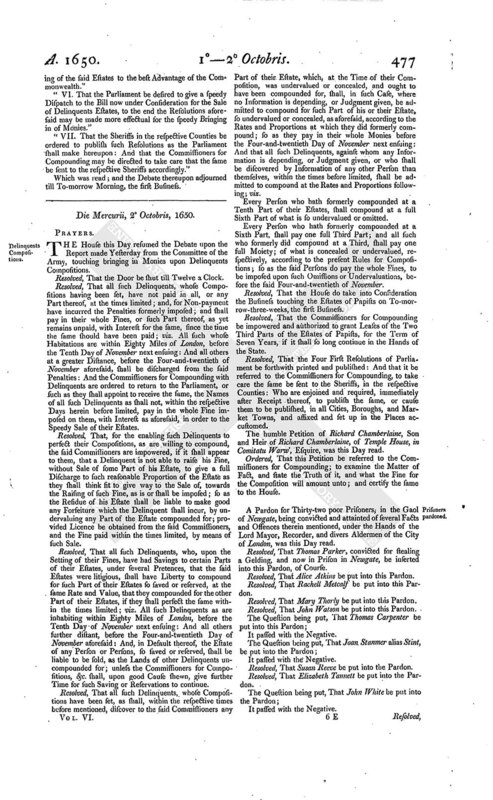 "V. That the Parliament having formerly held forth, That they would appoint a Time to consider of Rules for the Disposing of the Estates of Papists, Delinquents, and other Papists belonging to the Commonwealth; they be desired to appoint a Time for taking the same into Consideration, and for giving Rules for the Disposeing of the said Estates to the best Advantage of the Commonwealth." "VI. That the Parliament be desired to give a speedy Dispatch to the Bill now under Consideration for the Sale of Delinquents Estates, to the end the Resolutions aforesaid may be made more effectual for the speedy Bringing in of Monies." "VII. That the Sheriffs in the respective Counties be ordered to publish such Resolutions as the Parliament shall make hereupon: And that the Commissioners for Compounding may be directed to take care that the same be sent to the respective Sheriffs accordingly." Which was read; and the Debate thereupon adjourned till To-morrow Morning, the first Business.